NEVAS has just recently formed and we are in the process of laying out our website. along with other Vintage Dance events in New England and beyond. Use the links below to sign up for classes and the dance weekend! 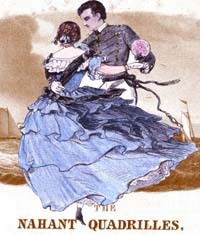 Prepare for the 26th annual Nahant Victorian Dance Weekend in August, with dance classes focusing on mid 19th Century through Ragtime Era dance basics, emphasizing ballroom etiquette, period movement & styling, and popular rhythms. All levels of dance experience welcome. Classes will be taught by Ben and Katy Bishop assisted by their son Nick. 467 Main St., Wakefield, MA. Accessible by commuter rail and bus from Oak Grove T stop. We’re planning a fun filled Historic dance weekend; registration will open soon! We’ve sold out for the last several years, a deposit today will reserve your spot at the event. Follow the link below to paypal to reserve a space. This amount ($25) will go towards your fee when registration opens.